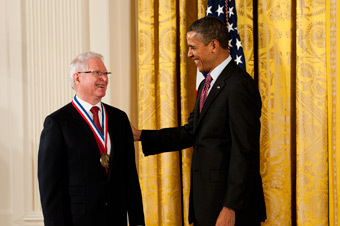 New York, NY, February 1, 2013 – At a White House ceremony today, President Obama conferred the National Medal of Technology and Innovation on Dr. Jan Vilcek, Professor of Microbiology at the NYU Langone Medical Center and President of the Vilcek Foundation. Twenty-two other distinguished scientists and innovators were also recognized for their extraordinary accomplishments in science and engineering. Dr. Vilcek, an immigrant from the former Czechoslovakia, received this honor for his pioneering work on interferons and contributions to the development of therapeutic monoclonal antibodies. His work was instrumental in the development of the anti-inflammatory drug Remicade®, now widely used for the treatment of Crohn’s disease, rheumatoid arthritis and many other chronic inflammatory disorders. A native of Bratislava, Slovakia, Dr. Vilcek’s path to the United States was not an easy one. Carrying little more than a suitcase and the list of a few professional contacts, Dr. Vilcek and his wife Marica defected from communist Czechoslovakia during a visit to Vienna, Austria. From there, they crossed yet another border to West Germany, where they applied to be granted refugee status in order to receive immigrant visas to the United States. Upon immigrating to the United States in 1965, Dr. Vilcek joined the faculty of New York University School of Medicine where he devoted his career to biomedical research in the field of immunology. Marica Vilcek, an art historian by training, joined the curatorial staff of the Metropolitan Museum of Art. A devoted scientist and educator, Dr. Vilcek is also a generous philanthropist. With the royalties due to him for his inventions made as a faculty member at NYU, in 2000, Dr. Vilcek and his wife established the Vilcek Foundation, dedicated to raising awareness of immigrant contributions to the American arts and sciences. The Foundation awards annual Vilcek Prizes in biomedical science and the arts, sponsors cultural programs, and hosts the work of immigrant artists in its gallery space in Manhattan’s Upper East Side. The Foundation’s mission was inspired by the couple’s respective careers in biomedical science and art history. The Vilceks have also made major gifts to the NYU Langone Medical Center and the Metropolitan Museum of Art. The Vilcek Foundation’s growth and development over the past decade is a tribute to Jan and Marica Vilcek’s appreciation for the opportunities they found as newcomers to the United States. By linking American arts and sciences with immigrants’ contributions in its mission, the Vilcek Foundation possesses a unique and distinctly positive voice in the ongoing and often controversial dialogue over immigration in this country. Photo credit: Ryan K Morris/National Science & Technology Medals Foundation.